This two-day class will give you a functional understanding of Grasshopper concepts and parametric design. Learn and explore how Grasshopper generates unprecedented fluidity and automated tasks to go further in the design process, allowing for much greater speed working on complicated and repeating forms. 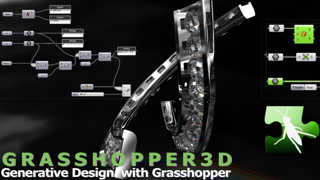 Grasshopper creates parametric modeling to automate production, new forms, shapes, patterns and your interfaces. It is only possible with the algorithmic modeling. No knowledge of programming or scripting required for designers to build form generators, from the simple to the grand and awe-inspiring designs. The class covers List management and introduces Date Trees. Prerequisite: Basic Rhino knowledge is required. Participants will work on jewelry projects. However, design professionals from all industries can benefit from this class. Required: PC laptop with Rhino 5 and the latest Grasshopper installed. Akiyo Matsuoka is an Authorized Rhino Trainer and adjunct faculty at Fashion Institute of Technology in NYC.